On the Podcast this week, from a November 2nd, 1951 NBC Radio Broadcast of The Dean Martin and Jerry Lewis Show, the boys welcome French actress Denise Darcel to the program. Dino sings Walkin' My Baby Back Home and Hangin' Around With You and later in the show reminisces with Just One More Chance. 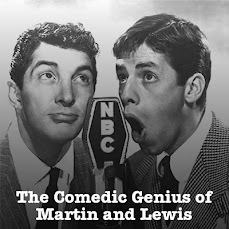 You can tell from this episode that Martin and Lewis were riding high, and beginning to adapt well to the new format for their radio show. If I may point out an error, the photo is not of French actress Denise Darcel, but of Spanish actress Sara Montiel.